My campfire cooking equipment at this point in time consists of one of those wire forks used for cooking marshmallows or toast over a fire. And, I have to admit, I haven't even toasted marshmallows with my sturdy fork, only bread and barbequed tofu slices. 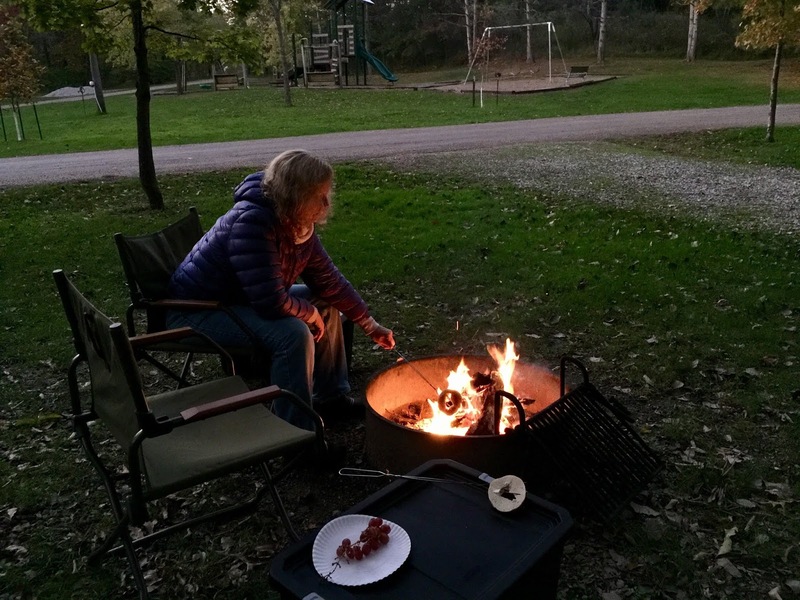 My wife and I have talked about adding campfire cooking to our tiny teardrop trailer camping experience (we regularly use cast iron cookware at home), so this winter is the jumping off point for our future campfire cooking experiences. I do find the concept of utilizing our campfire's wood and heat for more than something to look at an interesting possibility to add to our tiny trailer experience, and researching is always a first step. Many online articles and videos are available for reference, and I'll provide information I've gleaned plus links to interesting sites. There are many articles about campfire cooking, though, and I want this article to have a "boots on the ground" authenticity, which only experience can provide. 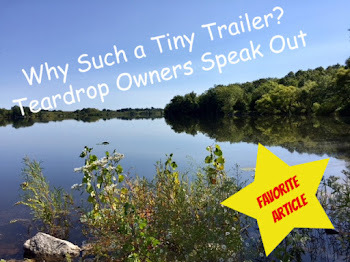 One teardrop trailer camper provided me with some experienced FB group advice of "the easier the better. Chicken, shrimp, beef kabobs. I usually marinate my meat or shrimp at home in a ziplock and freeze it. Easier than kabobs, put all ingredients in a grill basket and toss with seasoning and cook over the fire. Baked potatoes or seasoned potatoes in foil." This is already within my experience range, since I've toasted bread and heated BBQ tofu on a marshmallow fork. Roasting and baking are pretty straightforward, and the marinade-and-freeze home preparation method is a good one, easing not only the cooking but also the strain on the ice box. I can't wait to try out those wooden skewers I bought last year and never used! 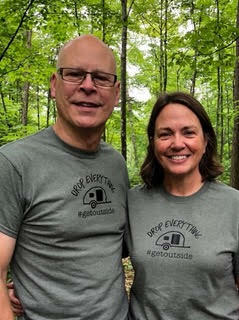 We're fortunate regarding cooking help because a tiny trailer camping couple, Ruth and Greg Seubert, who regularly cook over a campfire, are adding their hands-on campfire cooking know-how to this article. For the last thirty-five years, most of their camp cooking has been over a campfire, the last seven specifically connected to teardrop camping. 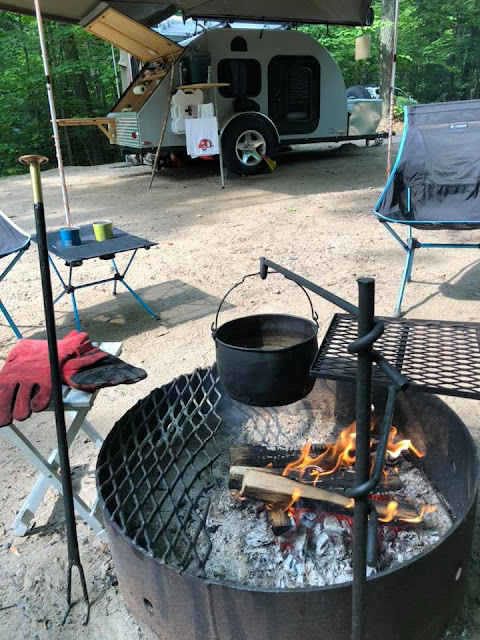 Although they do have a one-burner butane stove that they use every morning and sometimes on a chilly fall afternoon to make coffee, chai, or some hot chocolate, their main cooking experience is over the campfire. "All of our meals are made over the campfire. From breakfast, to an afternoon snack to our main meal, and popcorn in the evening. Ruth does most of the prep/cooking; however, Greg is the campfire master, and keeps it stoked and manageable so nothing is burned....or raw. We have been known to have a fire going in the rain with the Dutch oven meal cooking, running back and forth from under cover to check on it or for some stirring." Right off the bat, I was surprised at the number of sources that included detailed instructions of how to safely build an effective campfire. REI has a video, "How to Build a Campfire," which is pretty much Campfire 101, detailing safety, materials, and different building styles. Several other online articles provided similar basics, including two ideas specific to campfire cooking: 1) if there is room, use half of the firepit space for the fire and the other half for cooking with the coals, and 2) "grade" the coals to a uniform surface after the fire has died down. "Build the fire; grade the coals." The Seuberts cook with wood, but if more precise and consistent temperatures are needed, they use charcoal, which they start with the coals of the fire. "We just move aside any logs that are still hot and count out how many briquettes we need and throw them in. It's easy to know when charcoal briquettes are ready. The campfire is just a little trickier. Think of it as cooking over a gas stovetop. If something starts to boil too quickly, we remove a log, or lift up the grate. If it's not cooking fast enough or not staying at a simmer, we either add to the fire or lower the grate." With all her years of experience, Ruth Seubert names her essential campfire cooking equipment, and other than some good cast iron pieces, there are four items they wouldn’t go camping without: Billy Bob Campfire Cooking Grate, Fire Dragon fireplace blower/poker, a hanging kettle to heat water (hers is 60+ years old), and firefighter gloves (also called grill gloves). The photograph at the top of this article displays her set-up. Embedded below is a review from YouTube channel Living Survival that does a good job showing how to set up, adjust, and use the Billy Bob. The Seuberts have a definite routine they follow for setting up their cooking stations, including the firepit and ironware, a place for food preparation, and access to all their campfire cookware and accessories. "The Billy Bob is one of our favorite camp accessories. For years we used a fry pod, but we got tired of 'chasing or spinning' the food to where we wanted it to be. The Billy Bob is one of those things we consider part of set up. Greg gets the stake pounded in and the grate leveled, we hang our water kettle, and we are good to go. Our fire gloves are always next to the fire, along with our Fire Dragon. With our teardrop everything is in the galley. Our cast iron skillets, the Dutch oven and kettles are visible and easy to reach. We also have two tables attached to our teardrop, and a pullout table if we need more space or we want to be under cover. 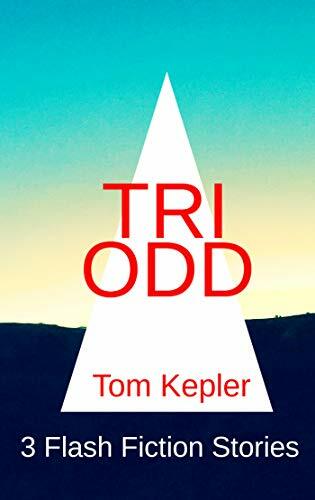 "When we're ready to cook, an old tablecloth goes on the picnic table, and anything I need for the recipe comes out of the galley or the cooler. We've used the Billy Bob with a cast iron skillet, the Dutch oven, or foil packets over the fire. BBQ'd ribs have been made directly on the grate. Depending on what our menu is for a camping trip, I do as much prep work at home as I can. Cut up vegetables and chicken go in jars. Dry items such as measured-out flour, sugar or other ingredients needed for a recipe also go in jars and are stored in the galley. Potatoes and onions are in cloth bags. We rarely bring more than we need." I've researched various Lodge cast iron cookware pieces and already own a griddle and skillet my wife and I can allocate to camping. Lodge, an American company since 1896, has a wonderful website that I intend to study further. Lodge manufactures and sells cast iron, enamel, and carbon steel cookware. The website contains not only items for sale but also lots of information about the use and care of cookware. In addition, the site includes outdoor accessories (including campfire tripods and cooking utensils), recipes, and videos. With all cookware, though, be sure to consider not only the quality of the product but also the size of the skillet or pot in regards to the number of folks you are cooking for. We already have a cast iron griddle/grill and a skillet, so we probably will begin our campfire cooking experience without buying a lot of new cookware. Best to pick up some hands-on experience first, we think. However, I've embedded below a Lodge video about the Cook-It-All, an interesting cast iron piece, which "combines the utility of a cast iron camp Dutch oven with a griddle, grill pan, wok, skillet, and more for cooking over live fire or coal briquettes." The added highlight of the video for me is not the cookware preview but opportunity of seeing a chef out camping and using the product--inspiring . . . and intimidating. Searching online reveals many products for campfire cooking, from cooking tripods and grills to cookware and accessories. I've only mentioned a few sources. Retailers such as Cabela's or REI are always places to look for what you need. Barebones is a company that sells a number of products, including cookware, and also has a blog with recipes, including quite a few vegetable dishes. And, of course, there are always the Amazon and Walmart possibilities. Choose what you need. Although we're all cooking, there's plenty of room for variation. Although Ruth Seubert has commented on our introductory campfire cooking topics, now it's time to turn the spatula over to her. Describe some easy campfire cooking for beginners. "The easiest thing to make over a campfire is breakfast. One cast iron skillet is all you need for a number of meals. Bacon, eggs, frittata, pancakes, french toast. We've made lemon blueberry biscuits and coffee cake. 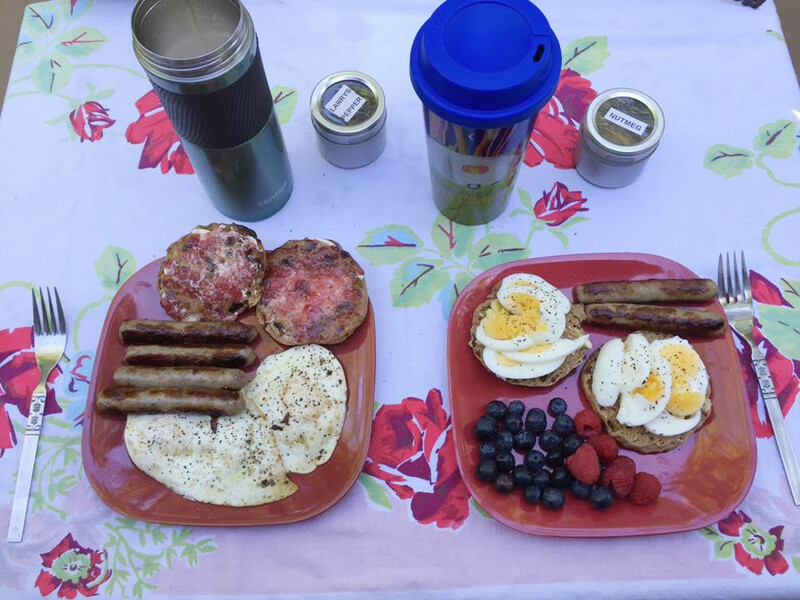 It's probably our favorite meal camping because we have the whole day ahead of us and good food in us! The majority of the time we do not plan or prepare for a lunch. We sleep in, have a later breakfast, explore, bike or hike, and return for our supper. With the Billy Bob it is easy to move a dish off to the side, or up, if the fire gets too hot or you need to add more wood. "The lemon blueberry biscuit recipe is the best! I always measure out the dry ingredients at home and put them in jars. At camp, I just need to add eggs, oil, blueberries and some fresh squeezed lemon and lemon peel. Mix it all up, put a parchment liner in the Dutch oven and spoon in the dough. If the recipe says 350 degrees, that's what we bake it at using the right amount of coals on the top and bottom. There are times it needs to go a little bit longer at camp, but we're usually patient because we know how good they are going to be. When done we drizzle a bit of powdered sugar glaze over the top, have our lattes and enjoy. Our newest Dutch oven has the temperature and amount of coals needed for the top and the bottom right on the lid. Whoever thought of that is a genius!" What are some complementary tools that are good to have on hand? "A good pair of tongs is a must, preferably with a long handle. Otherwise we wear the fire gloves so we don't have any burned knuckles or singed arm hair. I like to have a cloth table covering while getting all the ingredients ready. We use cloth napkins and stay away from plastic anything or paper plates. I'd rather do dishes than throw stuff in the garbage." "Seven years ago, the start of our teardrop camping life, we decided for that first year we wouldn't have any of the typical Wisconsin camping food. Hamburgers, hot dogs, or bratwurst were not on our menus. After that first year, we never looked back! We plan meals that we enjoy at home and figured out what we needed to make the same dish over the campfire." Although they have found some good recipes out of books, most of their recipes are found online, part of their home preparation. "We've had taco or tortellini soup, made at home and reheated over the fire. These work perfect for times when we are going to get to the campsite late or in the dark, and it's easy to heat while we're setting up. We have a good hot meal and don't consider stopping for fast food on our way. Jambalaya is a favorite meal, either in the Dutch oven or in foil packets. Lasagna, Sloppy Joes, BBQ chicken made in a pudgy-pie iron, chicken and dumplings, chicken pot pie. Nachos are easily made over the fire, along with grilling chicken or BBQ ribs. We've made donuts over the fire, pineapple upside down cake, and baked cookies and coffee cake in our Swedish Reflector Oven, and popped popcorn in the Dutch oven. We bought a Swedish reflector oven for baking. It folds flat, so it doesn’t take up much room in the galley at all. We’ve made coffee cake, cookies and cinnamon rolls. We control the temperature with the fire embers, moving it closer or further away depending on how the temperature is fluctuating. It’s a fun way to be able to watch your food bake. If you're thinking these all sound like comfort foods--you're exactly right!! "We do have vegetables: a spicy slaw is one of our favorites and is easy to prep at home by cutting up the cabbage, peppers and onions, and making the dressing and putting it in a jar. And vegetables are included in our meals, celery, carrots, potatoes, peppers, etc. 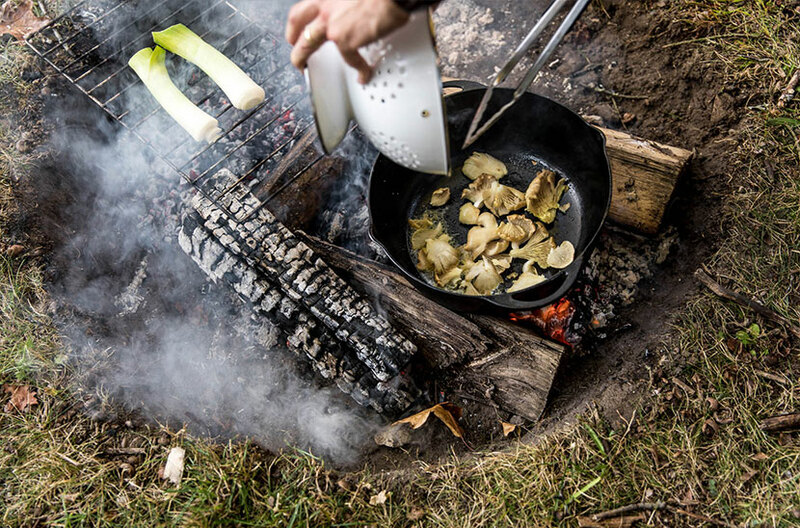 I admit, we don't usually have a vegetable as a side dish while camping." What is the most "gourmet" meal you've cooked over a campfire? Is it possible? "Well, we rarely eat 'gourmet' meals even when we're home! The most unusual thing was probably Baba Ghanoush, cooking the eggplant over the fire and grilling tortilla shells until crisp. It was delicious! People can't believe we make chicken pot pie over the campfire, but with the Dutch oven being like an actual home oven, you can make just about anything and get a nice browned crust on top." "A Simple Evening: An Outdoor Gathering with Barebones Living"
One might think that campfire cooking is an expensive hobby. There is a lot of cooking equipment that can ease and facilitate the experience, but ultimately fancy is not absolutely necessary. Our ancestors cooked over fires, but it's good to remember that for them, the tripods and spiders and hooks they used were their everyday cooking equipment, not just hobby equipment. If they cooked on something like the Billy Bob grill, they didn't also own a Bosch gas stove. An inexpensive grill and a cast iron skillet or pot, stones or wood for supporting the cooking surface and adjusting height--how simple and unadorned the campfire cooking experience can be! While perusing YouTube, I even ran across videos of using a flat rock as a cooking surface. The Seuberts have something to say about the simple pleasure of cooking over a campfire. "When we are camping it's about being outside and keeping it simple. We don't have any electric appliances. In seven years we probably have only 'plugged in' a total of three weekends. Usually because it was a last minute site, and we had to pay for an electric hook up anyway. A great memory for us is when we camped, literally, 'on the prairie' in DeSmet, South Dakota, at the Laura Ingalls Wilder Museum. 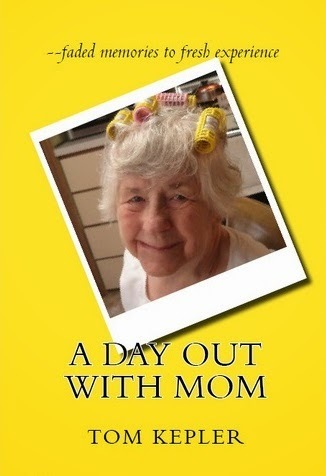 I remember thinking, 'I could have lived like this!' We love opening up the foil, flipping eggs and bacon in the skillet, taking the lid off the Dutch oven or releasing the pudgy-pie iron, amazed at what we created. When we take our first bites, it tastes so much better than at home." Thank you so much for sharing your cooking experience and wisdom, Ruth and Greg. My wife and I intend to start simple and then make our buying decisions after some experience. Our wonderful little Jefferson County Campground, which is one of our favorite camping spots, is only four miles from our home. 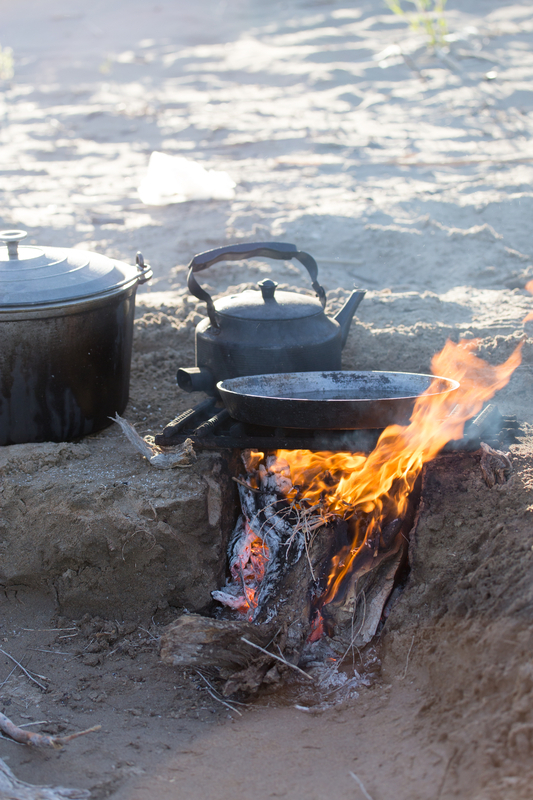 Campfire cooking will be a great way to enrich our camping experience. How about my wife and I camp there and try a little campfire cooking this spring in May when the campground opens? That's only a little over three months away. What!? Three months? Maybe I'd better check out some other campgrounds close by. Stephanie West Hawthorne from a FB camping group asked me to share three recipes. Thanks, Stephanie! 1 bottle of a beer. In your dutch oven, brown your sausage and onion, with a drizzle of olive oil. Add your potatoes, brussel sprouts, corn cob, carrots, and any veggies you want. (We add mushrooms often, but not until about the last ten minutes of cooking.) Add your seasonings and be fairly liberal with them. Add your bottle of beer, cover and simmer. Cook until the potatoes and carrots are tender. Serve and enjoy! Making me hungry reading the blog. That can't be good for me. Thanks for another great article. Cut steak, peppers, and onions into strips and with a little olive oil, sauté in your cast iron pan. (use a deep cast iron pan, or your dutch oven). Add your fajita seasoning, and a tad bit of water. Cover and let cook until the veggies are cooked through and soft. Once the meat and veggies are cooked, put them into a bowl and off to the side. Fill the bottom of your pan with a layer of tortilla chips, then add about ¼ of the Queso Blanco. Add ½ of your meat, pepper, and onion. Top with cheddar cheese. Add another layer of the tortilla chips and repeat the layering. Put the pan back over the fire for about 10 minutes or so, until the top layer of cheddar cheese has melted. Be careful not to have a flame hitting the pan. You don’t want to burn the chips. When the cheese is melted, scoop out the servings for each plate. I have all the toppings in small dishes in the center of the table so that everyone can pick and choose what toppings they want. These nachos are simply the best! Savory, and a hearty meal in one pan.